CABA – THE GOLD STANDARD – GREATEST SHOW ON DIRT! Welcome to 18U Wood World Series - Cheyenne, Wyoming! CABA events are known for great fields, top organization and the best competition. Over the past 30 years CABA has become the GOLD STANDARD for youth baseball events. 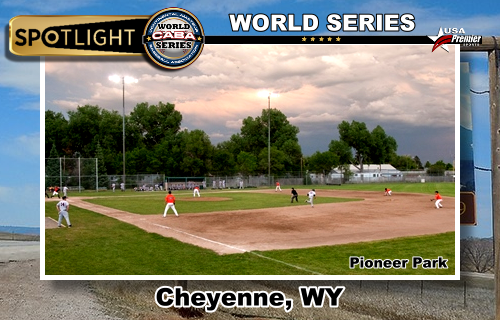 Cheyenne, Wyoming is ready to crown the next 18u CABA World Series Champion! 7 Inning Games Pool Play for seeding Finals and closing ceremonies for all teams. Game Format: 16 Team Limit - Check in on July the 8th and games will begin July 9th through the night of the 14th. Guaranteed 5 Games (weather permitting) 7 Inning Games Pool Play for seeding Finals and closing ceremonies for all teams Sunday the 14th.